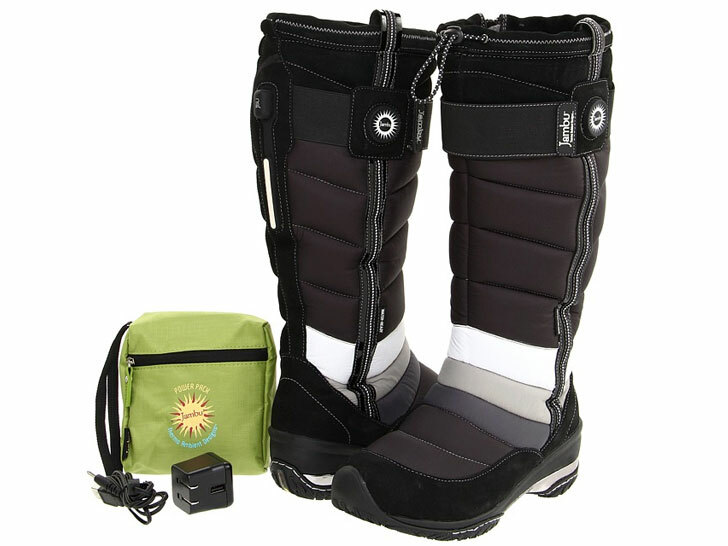 You may have some hot stilettos in your closet, but nothing will make your winter wardrobe sizzle like the new “Volt” heated boot by Jambu. Each pair comes with its own on-board ignition switch, a heating plate that reaches up to 122º Fahrenheit, and a rechargeable lithium-ion battery for dual-source charging. With just one touch, you can keep your insoles toasty for five consecutive hours, as well as activate the piped lighting for extra nighttime security. Other amenities include a partially recycled rubber outsole with all-terrain traction, water-resistant insulation, and extended toe and heel bumpers to cushion blows. Available in “blizzard gray,” “brownie melt,” and “black ice,” the futuristic Volt will make frostbitten toes ancient history. @Q Besides garments that are ostensibly "green," we also cover wearable technology that improves people's quality of life. Plus, they're rechargeable. Beats constantly throwing out used foot warmers. The light up part feels a bit gimmicky but I can see the rest of the appeal. hi can someone please let me know where to buy these and how much they are. You may have some hot stilettos in your closet, but nothing will make your winter wardrobe sizzle like the new "Volt" heated boot by Jambu. Each pair comes with its own on-board ignition switch, a heating plate that reaches up to 122� Fahrenheit, and a rechargeable lithium-ion battery for dual-source charging. With just one touch, you can keep your insoles toasty for five consecutive hours, as well as activate the piped lighting for extra nighttime security. Other amenities include a partially recycled rubber outsole with all-terrain traction, water-resistant insulation, and extended toe and heel bumpers to cushion blows. Available in "blizzard gray," "brownie melt," and "black ice," the futuristic Volt will make frostbitten toes ancient history.